Late in 2015, Germany's Handelsblatt reported, erroneously, that Venezuela was the best performing asset class of 2015. It wasn't. The reason this was in error is because if one adjusts the returns into the real currency exchange rate, one which reflects the true implosion of the economy, instead of the government "mandated" one, the result is very different, one which shows that contrary to popular wisdom, during hyperinflation stocks are not a good store of value. 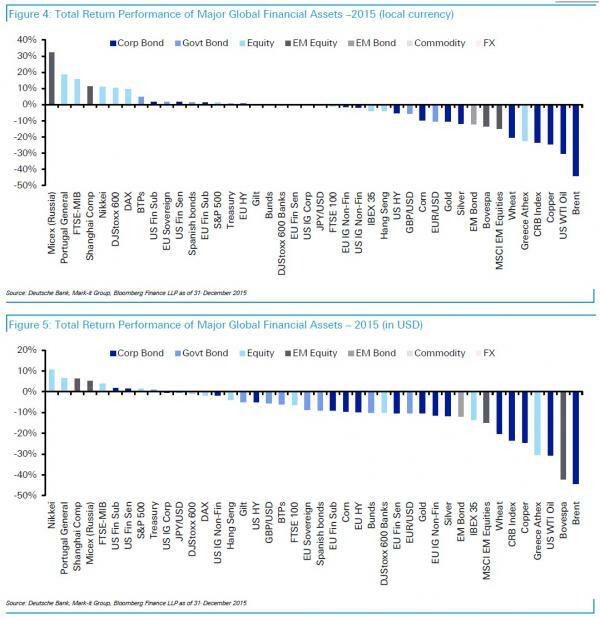 So what were the real best and worst performing assets of 2015? Here, with the full breakdown in both local currency and USD-redenominated terms, is DB's Jim Reid. With markets wrapped up for 2015 now, reviewing the performance of asset classes last year shows that it was one where negative asset class returns were aplenty, while those finishing in positive territory were few and far between. Indeed, of the 42 assets we monitor in Figure 5, just 9 finished with a positive return in Dollar-adjusted terms over the full year. Of these, the big winner was the Nikkei (+10.4%) - boosted by the accommodative BoJ and relatively stable Yen. In the periphery we saw both Portuguese (+6.5%) and Italian (+3.9%) equity markets also close higher, while in China the Shanghai Comp (+6.2%) finished up for the year but not without some huge volatility over the 12-months and of course ending well off the highs it posted back in June. The S&P 500 (+1.4%) also closed just about in positive territory for the year on a total return basis although that performance was the worst for the index since 2008 as energy stocks clearly weighed for much of the year, while there was a similar return for US Treasuries (+0.8%). At the other end of the scale there were some notable losers for us to pick out. In particular it was Oil which stole the limelight with huge falls for both Brent (-44.1%) and WTI (-30.5%) while Copper (-24.4%), Wheat (-20.3%), Silver (-11.7%) and Gold (-10.4%) were also hard hit. Both political and economic fragility saw Brazil (-42.0%) and Greece (-30.3%) fall the most in the equity space while EM equity markets finished with a broad -14.8% decline. US Dollar strength was a big theme for 2015 as evidenced by the lack of winners above with the Dollar index returning a hefty +9.3% for the full year. 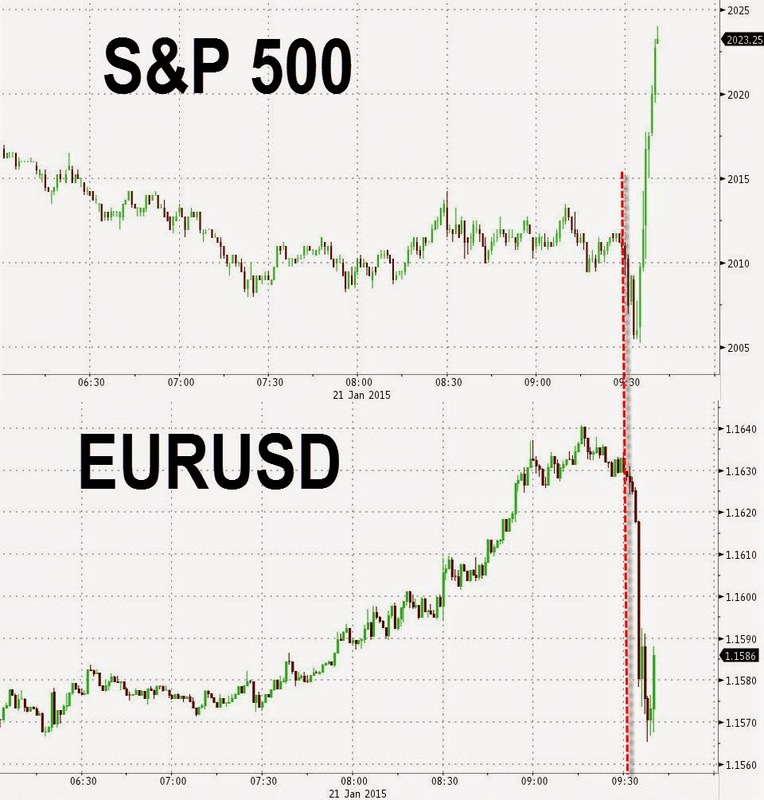 This meant there were decent falls for the Euro (-10.3%), Aussie Dollar (-10.7%) and Canadian Dollar (-16.1%). In local currency terms Russian equities (+32.3%) came out on top along with some of the peripheral markets. 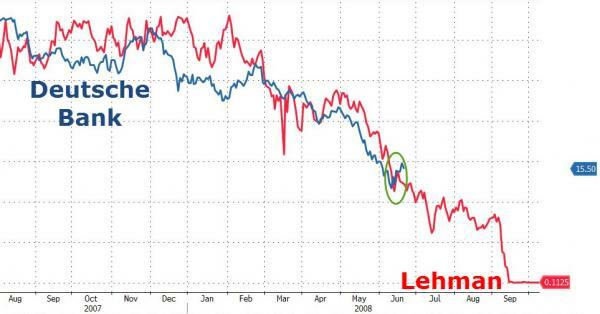 In the credit space it was the divergence between European and US credit which was most notable. Reflecting the higher exposure to energy credits, US HY closed with a -5.0% loss for the full year, while US IG was down a more modest -0.4%. In Europe we saw EUR HY finish +0.5% and EUR Sub Fins +1.4%, although EUR IG Corp was down -0.7%. Again converting this into US Dollar terms results in any gains for European credit being wiped out and in turn underperforming US credit for the full year. Things are escalating... Energy credit markets are pushing back towards record high spreads, copper is pushing back to the overnight lows and gold and silver are flat. US equity markets are the big movers withThe Dow down well over 300 points today (and nearly 700 points in the last 27 hours) and the S&P now down almost 5% from its highs. Treasury yields are 8-10bps lower on the day with 30Y yields at record lows and 10Y close. 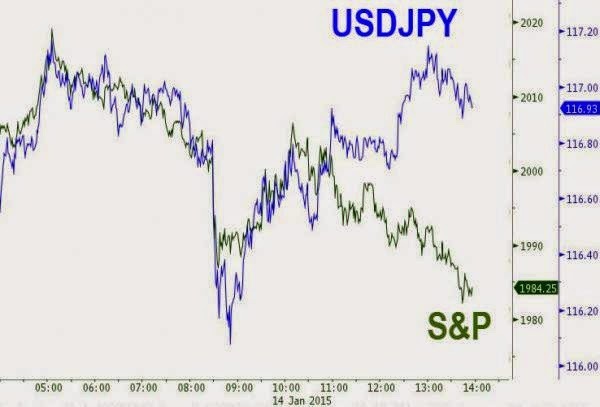 And the machines have a problem as JPY carry has decoupled from risk..
As 2014 has closed, we want to present our view of where markets are headed in 2015 in a series of coming articles. Toward the end of this series, we will cover real estate and the economy, something slightly different than what we normally cover in our market reports, but something you may find quite interesting. Let's start by saying this: The year 2015 will be historic, with unusual events and high market volatility. We believe there will be at least one stock market crash in 2015 (a decline of 15 percent or greater, probably much greater than a 15 percent decline), with perhaps one or more mini-crashes (10 percent or more). 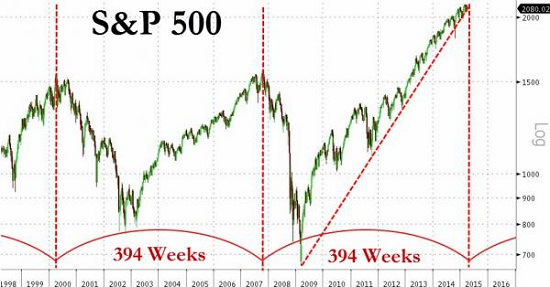 We believe that the largest stock market decline in 2015 will be a crash, and that this crash will be underway (could last several weeks or months) within two weeks before or after September 14th, 2015. In other words, we see a stock market crash in the latter third of 2015. It could be huge, and could change the financial, political and regulatory landscape for years to come. There is a convincing amount of evidence for this in this author's opinion. 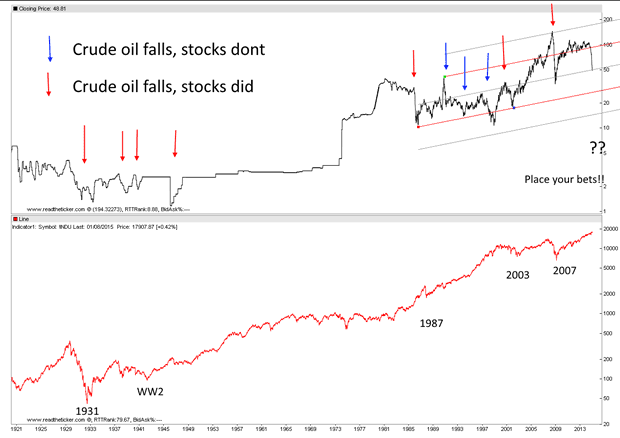 First is the multi-decade Jaws of Death pattern. It is finished or will be by the latter part of 2015, and warns of a mega-decline in the stock market, and an economic depression. I wrote a book about this (available at amazon.com) that many of you have read. 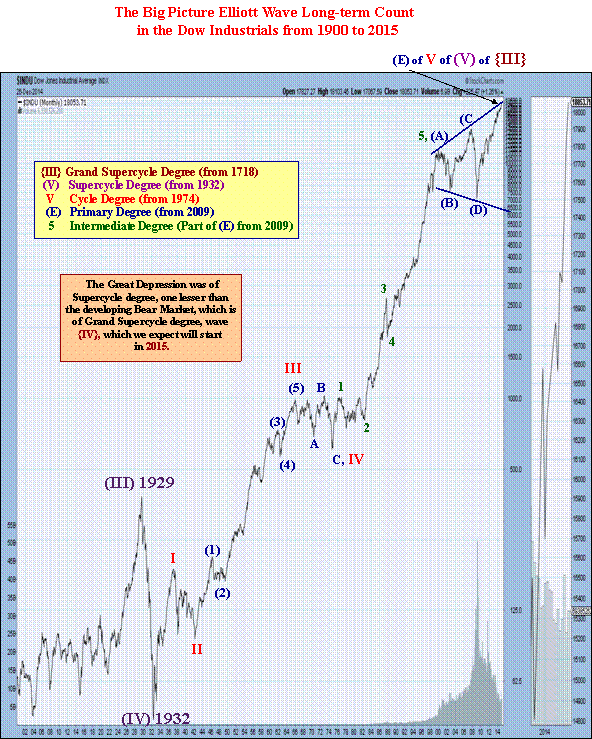 The time will be at hand for the fulfillment of this stock market pattern in 2015. 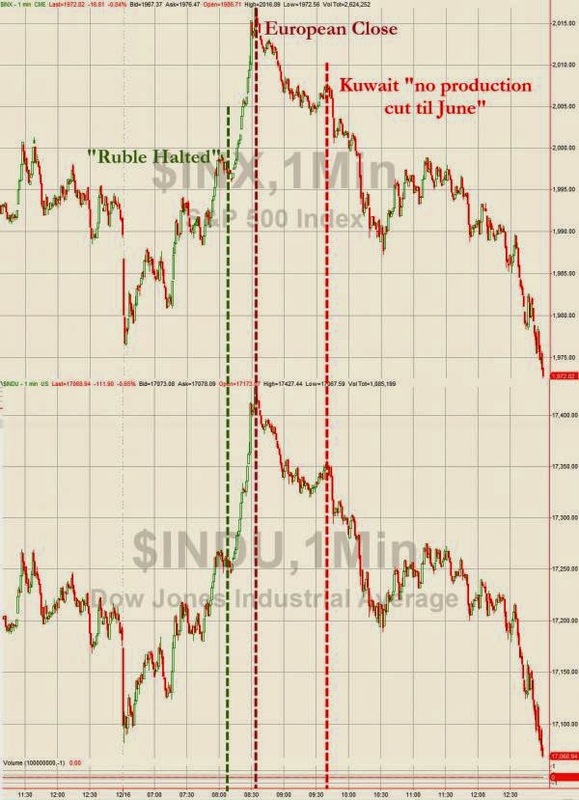 The second convincing piece of evidence is a cycle pattern we follow that is rare and extremely correlative to stock market declines and economic downturns, pointing to a powerful economic and market collapse around September 14th, 2015. 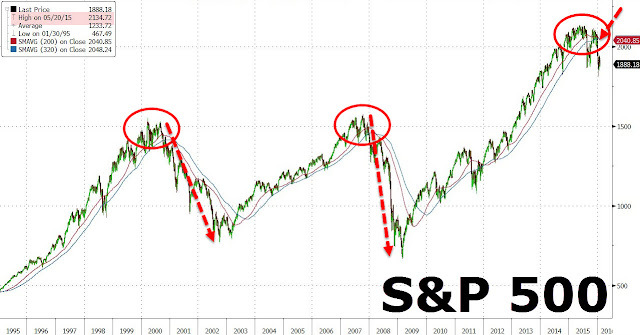 This cycle pattern was present for the 2008 and 2001 market plunges. It will be present again in 2015, the first time it has been evident since 2008. Then there is the Bradley model which is an astro cycle turn indicator which points toward a turn on September 23rd, 2015. We also have a Phi Mate Turn date scheduled for September 15th, 2015. 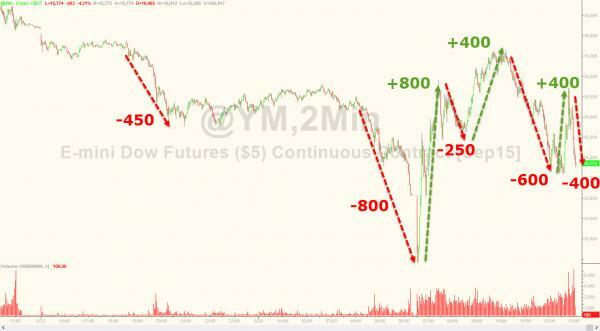 The multi-decade Jaws of Death stock market pattern is calling for an economic collapse and a market collapse. This is a Bear market for the ages coming, which we believe is already starting in stealth, masked by the artificial stock market rally whose main purpose has been to hide the truth about the underlying economy's collapse, including the unannounced disintegration of the middle class in America. Part and parcel with Bear markets are social strife issues. A negative psychological state of mankind. One developing social strife that will have an enormous negative effect upon the stock market and the economy is the civil war that is breaking out in the United States between liberals and conservatives. It is time to call it what it is, a civil war. We see this in Washington's inability to govern and negotiate. We see this with our judicial systems' decision-making being driven ideologically, interpreting laws according to the justices' in power political views and personal values, with relativism and the ends justifies the means enforcement of American jurisprudence evident in many cases. The divide is wide and passions are at the brink of violence. Truth is being redefined as a point of view. The U.S. Constitution is being rewritten by court decisions and precedent cases that could be completely distant from what is written on that sacred piece of paper. The plain language of the U.S. Constitution is being ignored and replaced by pseudo intellectual hyperbole. This brewing civil war will be a contributing factor in the destruction of the economy and the stock market in 2015 and beyond, not to mention America's traditional values and way of life. Not always, but you will have to consider modern finance this time? 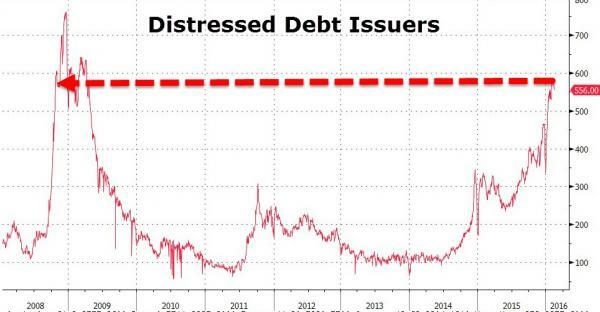 - Debt and derivatives blow ups associated with Oil companies. 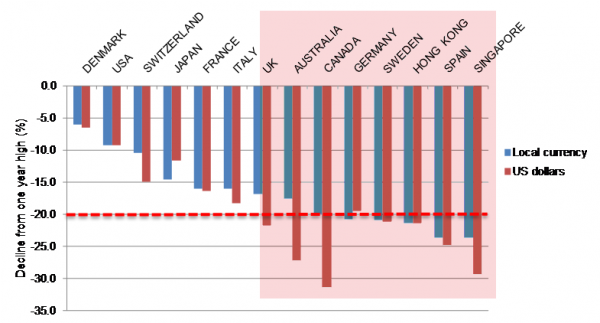 - Percentage of economic growth lost verses benefit of cheaper oil. As always timing is the factor, how much pain will be felt before we get the gain? 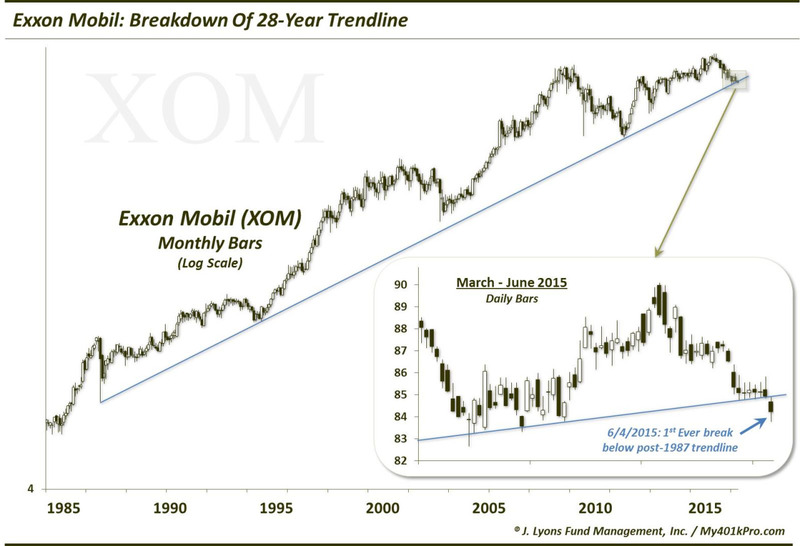 The next 12 months will be rocky as the bad oil news flows through the market. Chart: Crude oil on top, Dow Jones on the bottom. 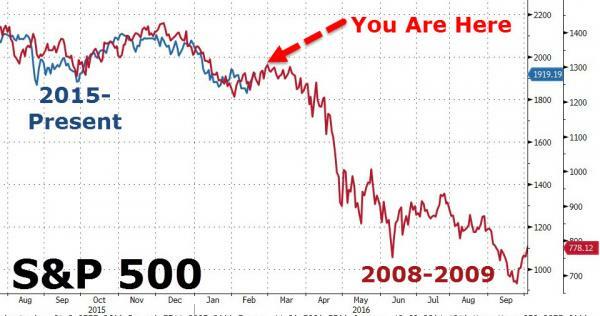 Jeff Gundlach: "If Oil Drops To $40 The Geopolitical Consequences Could Be Terrifying"
Question: The crash in the oil market is already causing jitters in the financial markets around the globe. What is your take on that? Gundlach: Oil is incredibly important right now. 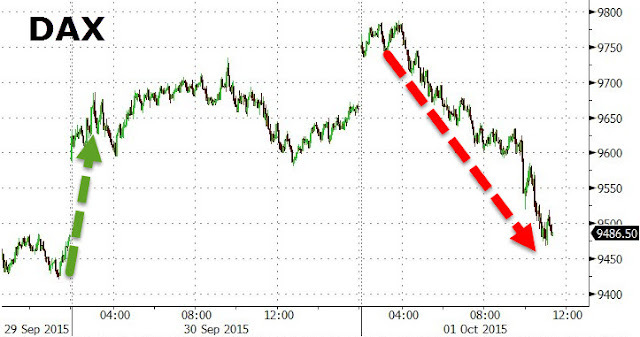 If oil falls to around $40 a barrel then I think the yield on ten year treasury note is going to 1%. I hope it does not go to $40 because then something is very, very wrong with the world, not just the economy. The geopolitical consequences could be – to put it bluntly – terrifying. 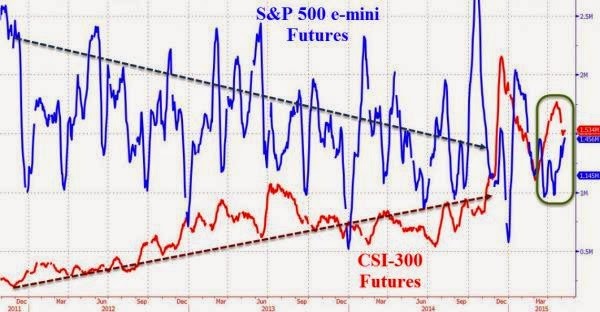 What would that mean for stocks? 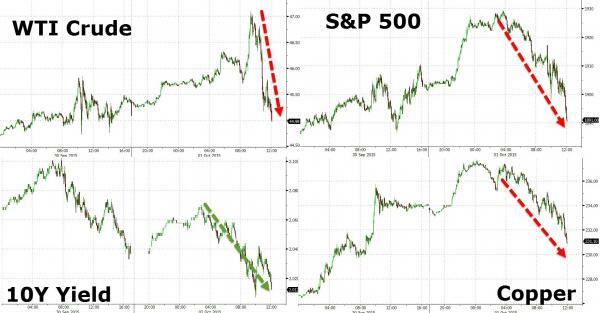 Large and rapid rises and falls in the price of crude oil have correlated oddly strongly with major geopolitical and economic crisis across the globe. Whether driven by problems for oil exporters or oil importers, the 'difference this time' is that, thanks to central bank largesse, money flows faster than ever and everything is more tightly coupled with that flow. So is the 45% YoY drop in oil prices about to 'cause' contagion risk concerns for the world? "In its November 14, 2014 Daily Observations ("The Implications of $75 Oil for the US Economy"), the highly respected hedge fund Bridgewater Associates, LP confirmed that lower oil prices will have a negative impact on the economy. After an initial transitory positive impact on GDP, Bridgewater explains that lower oil investment and production will lead to a drag on real growth of 0.5% of GDP. 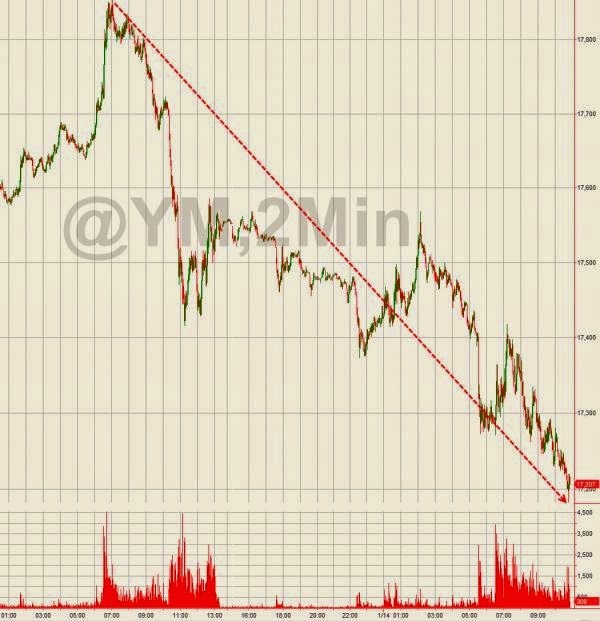 levels out at $75 per barrel, this would shift to something like -0.7% over the next year,creating a material hit to income growth of 1-1.5%." but the US credit markets were more worrisome as it appears the risk has finally started to appear in the investment-grade credit market.